Rustic charm meets high-end furnishings in this 3 bedroom, 2 bath vacation rental. 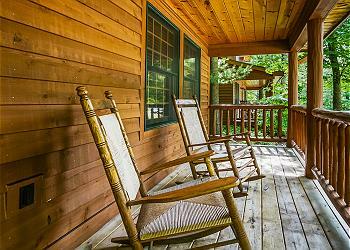 With hardwood flooring and upscale amenities throughout, this cabin is not lacking in taste. Vaulted ceilings and an open floor plan make the home perfect for entertaining larger groups. The home abounds with spaces to convene and find privacy. Located only a 5-minute drive from downtown Saugatuck and 7-8 minutes from the area beaches, Kingfisher Cove Cabin 27 offers the best of both worlds. Enjoy quick access to all of the area hot-spots and quiet relaxation upon your return home. Boasting a hot tub, association pool, association fire pit and dock access to inland Goshorn Lake--you might never want to leave. Providing a cozy retreat for the winter months and the perfect home-base for a fall color-tour getaway--this home offers something for everyone all year long. Larger groups might consider also reserving Kingfisher Cove 28 and Kingfisher Cove 29, which are right next door.